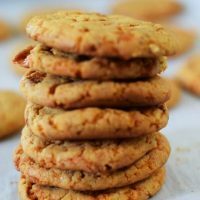 *This post is sponsored in conjunction with Christmas Cookies Week. I received product samples from sponsor companies to aid in the creation of the Christmas Cookies Week recipes. All opinions are mine alone. December is a month of festive fun! With that comes Christmas celebrations, and cookie exchanges with friends. It’s always a great time spent with people we love. Cooking and baking for them brings an abundance of joy throughout the season! It just doesn’t seem like Christmas without all things peppermint! 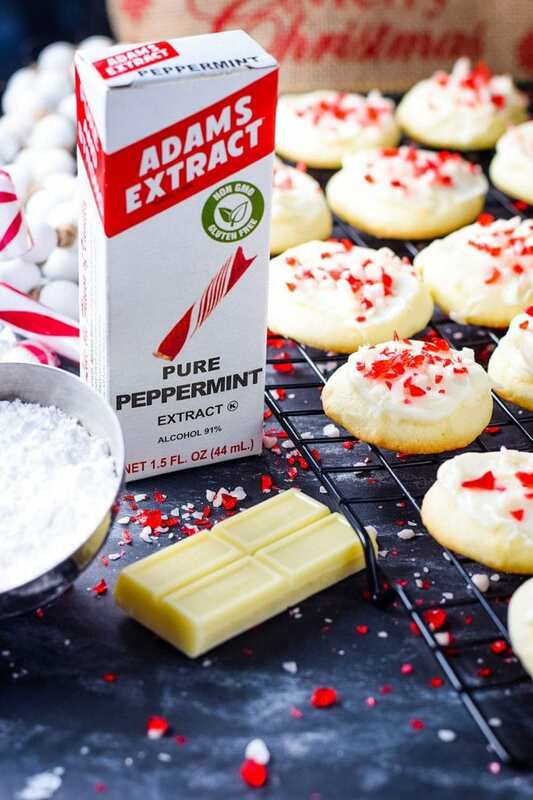 In celebration of Christmas Cookies Week, Adams Extract shares this delicious Peppermint Extract with me to use in my baking and I am OH SO GLAD ! It’s my favorite flavor of the season! 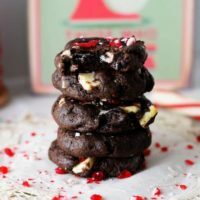 The extract infused these Peppermint Meltaway Cookies just splendidly! They are light, airy, and melt in your mouth. 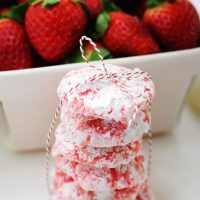 The icing is creamy and the peppermint gives it a brightness you won’t be able to resist! But to put it over the top – I add a little white chocolate just to add something extra specially sweet to the mix! 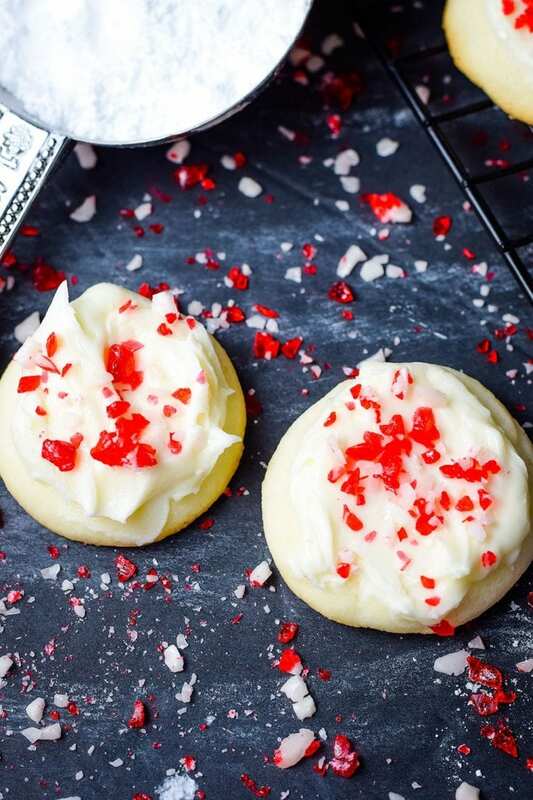 Top it off with these beautiful crushed peppermint candies and you have a sublime cookie to celebrate the season! In a bowl or stand mixer, beat butter and powdered sugar together until light and fluffy. Add in peppermint and mix. In another bowl combine flour and cornstarch. Slowly add in flour mixture into the creamed butter and mix until combined. Cover and chill in the refrigerator for 30 minutes to 1 hour, until firm enough to mold. Scoop out dough and form 1 inch balls and place 2 inches apart on baking sheet. Bake for 9 to 11 minutes or until bottoms are a light golden color. Let cool 1 to 2 minutes on baking sheet then remove to baking rack to cool completely. In a small bowl, beat butter until light and creamy. In a microwave safe bowl, melt bars of white baking chocolate according to package instructions. Usually in 30 second intervals then stir. Repeat until melted. Add in milk and peppermint extract, and melted white chocolate into the creamed butter and and mix until combined. Slowly add in powdered sugar until smooth. 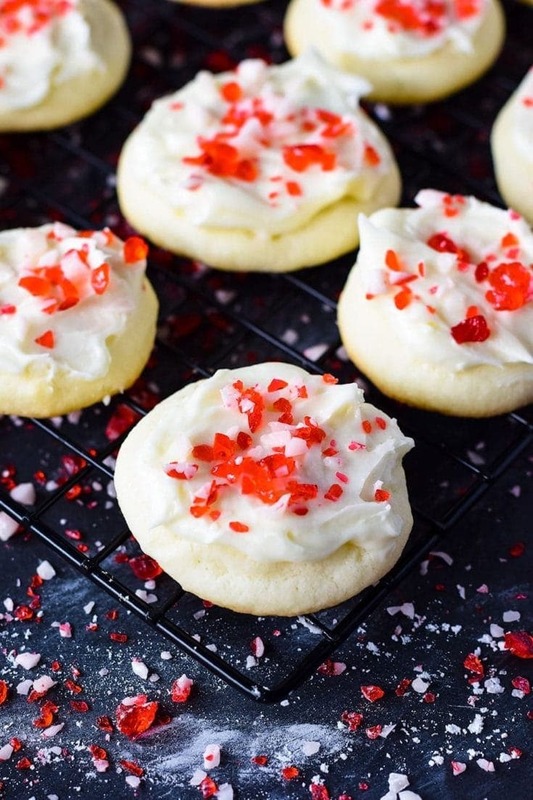 Ice cookies and sprinkle crushed candy cane candies on top. I hope that you will bake up a batch and share with your family and friends. I would love to see the pictures of what you bake up! Come on over and be social with us! 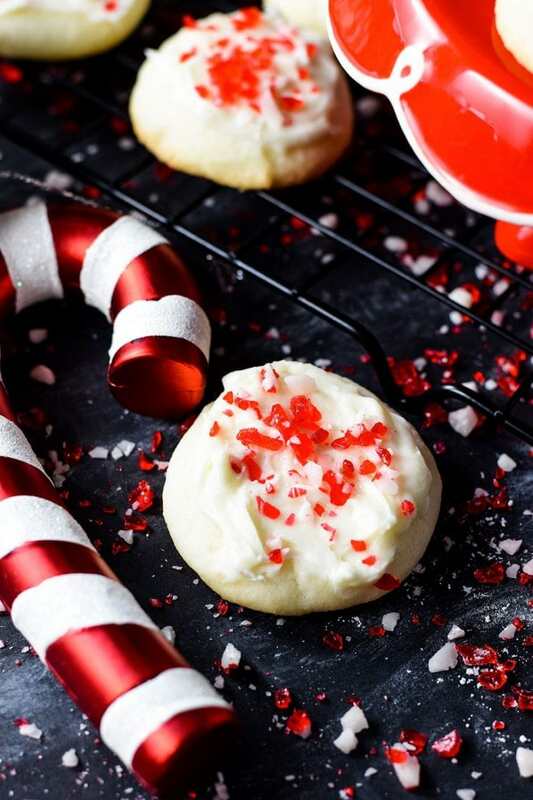 Soft and buttery Peppermint Meltaway Cookies are topped with a delicious light icing and trimmed with candy canes sprinkles. 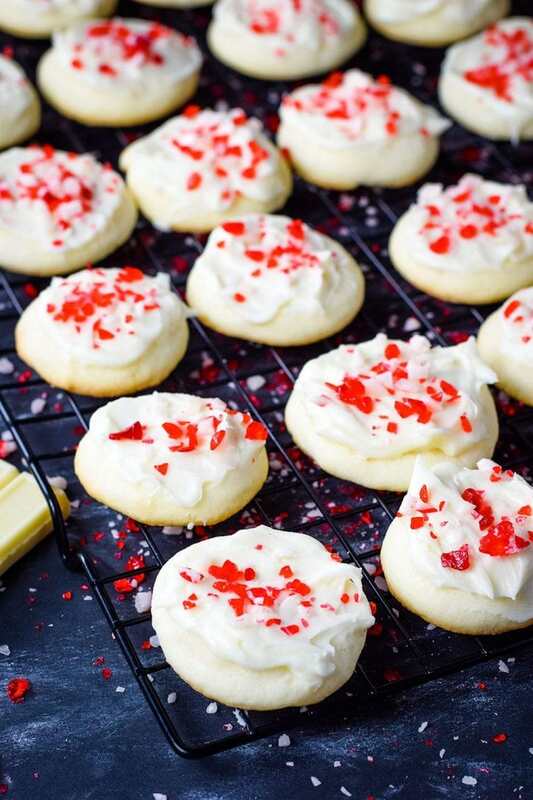 The perfect melt in your mouth holiday cookie. In a microwave safe bowl melt bars of white baking chocolate according to package instructions. Usually in 30 second intervals then stir. Repeat until melted. 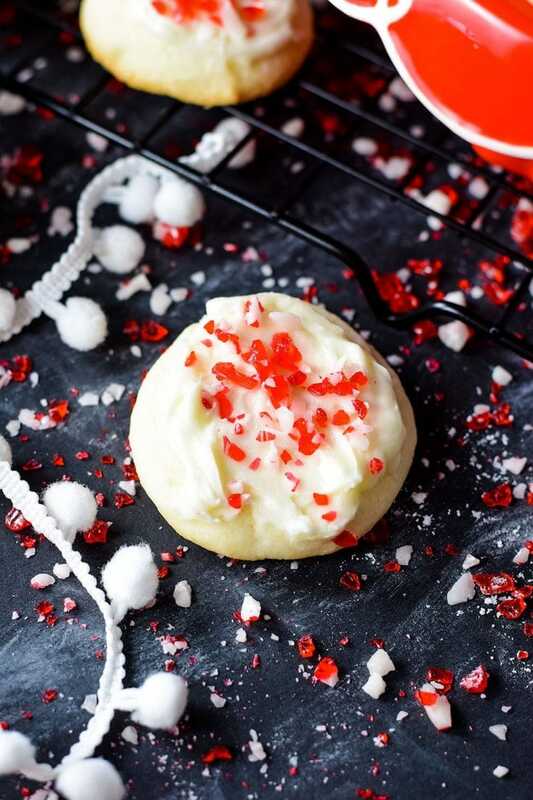 Ice cookies and sprinkle crushed peppermint candies on top. 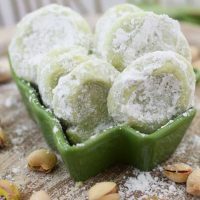 I have not tried freezing them yet. They are a pretty delicate cookie so I don’t recommend it. You can freeze the dough in a ball or make up the cookies balls ahead of time and freeze for up to 3 months. Let dough thaw in refrigerator overnight before baking. Thank you Wendy! I love the texture of these and peppermint is one of my most favorite flavors! Peppermint always gets my attention. Perfect cookies for Christmas! Me to my friend! It’s a go to for Christmas! Does the frosting “set” enough that the cookies can be packed in a tin for gift giving without smearing, or does it stay “tacky”? It sets up softly, but not really tacky. I store them in an airtight container with a piece of wax or parchment paper in between.